Today’s man is often on the go traveling for work and pleasure, working out at a gym, or playing community sports with their friends. Looking good while maintaining that busy lifestyle is important and being able to take that shampoo, shaving gear and deodorant with you wherever you go is the only way to maintain those well put together looks. Having a highly functional travel bag can help your man keep all those essential toiletries needed to keep them well groomed and feeling great. 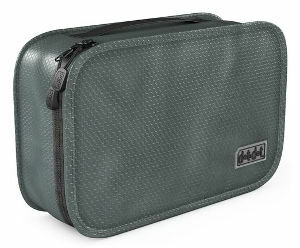 So, here is a look at some of the best travel toiletry bags for men on the go. If the man in your life does a lot of traveling, then having a hanging toiletry kit that can be opened and hung up for easy access to all of his toiletries may be ideal. This hanging toiletry kit by Dot & Dot is a well made bag that is perfect for traveling. It measures 11” X 6.75” X 3” and comes in 10 different colors including black, gray, green, dark blue, light blue, purple and red. It is waterproof which means it can resist splashes from the sink or shower. It also includes a hook for hanging the back. This toiletry bag has 3 pockets of varying sizes. There is a large bottom pocket, a medium size middle pocket and 2 smaller size top pockets to keep everything neatly organized. Users like this product and find it easy to pack in their luggage, easy to use and easy to clean. It is a nice size bag that keeps all of their toiletries neatly in order and holds much more than most users expect it to. 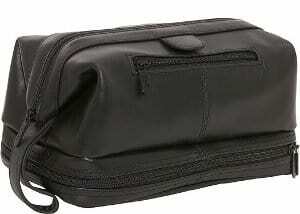 The AmeriLeather Toiletry Bag is a good looking bag that is designed to hold your toiletries while traveling. It measures 6.5” X 11.5” X 6.8”, made of real leather and comes in a choice of three colors: black, dark brown and brown. It features a doctor bag style opening and an interior zipper compartment. There are two net pouches on the inside and an outer zipper compartment on the bottom. Users say that it is both simply designed and made of good quality leather while also finding the craftsmanship of this bag excellent. This product has a roomy main section that is roomy enough to hold everything needed for travel. The bag is attractive, nicely designed and extremely durable. Although the bottom compartment is quite thin, it does come in useful for holding a number of small items that you want to keep separate from the main items in your case. The leather is supple, but somewhat stiff and most users do find this bag to be professional looking and great for traveling. It is black with contrasting stitching and features a zipper top that fully opens to make packing the kit simple and easy. There is also a zipper opening bottom section that holds the 3 free TSA bottles neatly and tidily with plenty of room for other small items. The inside of the kit is neatly lined and comes with a free toothbrush. Some users state that their bag also contained a collapsible cup together with the free toothbrush and TSA approved bottles. Users who travel frequently either by air or land seem to find that this product meets their needs admirably. They say that it is well designed as well as durable and that it holds a lot of items. It is extremely versatile and both the bottles and the collapsible cup are handy when traveling. There are relatively few complaints regarding this travel bag with the main complaint being from people whose zipper broke on the bag, but this problem seems to occur rarely and most users think that this bag holds up well no matter how much use they put it to. Knowing that Adidas is known for its sporting gear, you may find yourself wondering why this company makes a toiletry kit, however the name of the kit “Tourney toiletry kit” explains it all. 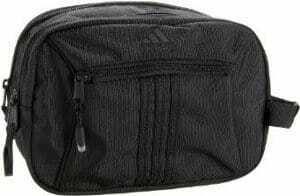 The Adidas kit seems to have originally been designed for athletes who travel to tournaments however, it makes an excellent toiletry kit for anyone who travels. The size of this bag is approximately 7.5” X 10” X 5 ½ .” It features a roomy main pocket and a smaller outer pocket for storing things you want to be able to get to quickly. Inside the main compartment, there is also a web pocket for additional items. The bag itself is nice looking and durable with a simple yet elegant design. The bag holds a lot of items, but isn’t bulky. While overall users like this bag and its overall design, they due tend to find the double zipper both cumbersome and something that doesn’t make sense since both zippers open to the same main compartment. Still, the spaciousness of this travel bag makes it worth putting up with the annoying zipper system. 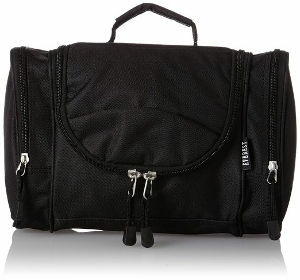 The Everest Deluxe Toiletry Bag is made of 600d polyester which is known to be strong and durable. This product measures 11.5” X 7.5” 4.5” and comes either in a black or a polka dot design. It is also made so that it can be hung on the back of a motel room or bathroom door for easy access to your toiletry products. This bag features several pockets to help you keep organized and has a dual side zipper pocket with a waterproof lining. Users like the overall design of the bag and say that it has a lot of space and an extremely strong zipper. It also has two side pockets which are handy, but the zippers for these pockets are at the bottom of the pockets which might allow items to fall out of the pocket when opening. People are pleased with its price although they state that the bag does not work well when hung up as it is not well balanced and the case tips spilling your toiletries out onto the floor. However, if you don’t plan on hanging this bag, it should suit most users needs very well. 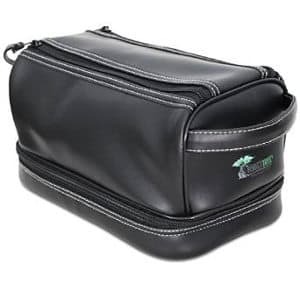 Toiletry bags makes traveling much easier and more organized for men and help keep their shaving and personal hygiene products all in place. So, if you are looking for a great gift for a man, then one of these toiletry bags make a great choice.